United States President Donald Trump on Friday praised India's "astounding" growth after it opened its economy and also lauded Prime Minister Narendra Modi, saying he has been working successfully to bring the vast country and its people together. Speaking at a gathering of CEOs on the sidelines of the annual Asia-Pacific Economic Cooperation summit in Da Nang in the Vietnamese port city, Trump cited India as one of the countries in the Indo-Pacific region making strides. He pointed out that India was celebrating the 70th anniversary of its independence and highlighted that the country was a sovereign democracy with a population of over 1 billion as well as the largest democracy in the world. "Since India opened its economy, it has achieved astounding growth and a new world of opportunities for its expanding middle class," Trump said. "And Prime Minister (Narendra) Modi has been working to bring that vast country and all of its people as one. And he has been working at it very, very successfully indeed," the US president said. Earlier, a senior Trump administration official told reporters travelling with the president from China to Vietnam said that India is a major economy that has registered fast growth. "Prime Minister Modi has been doing a lot in the way of pressing reforms to allow India to pull even more people out of poverty," the official, who spoke on condition of anonymity, said. India, the official said, is increasingly a partner of America in security terms as well, and it also happens to share many values in common with the United States. 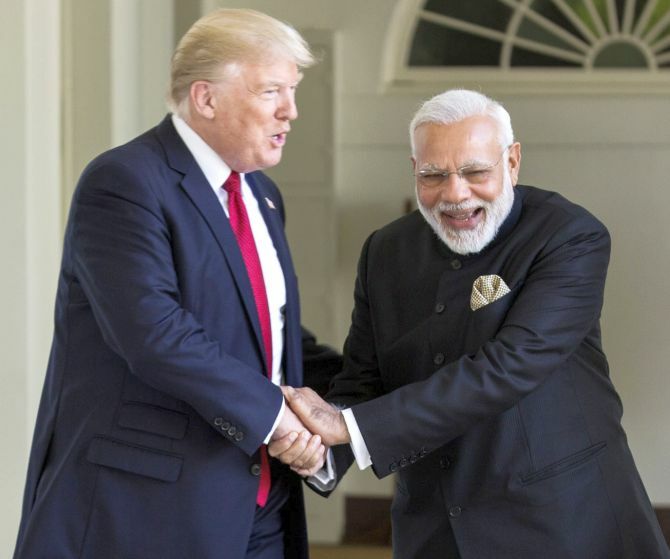 "India and the United States are the world's first and second largest democracies, and both of us have an abiding interest in the maritime commons remaining open and trade continuing to flow freely," the official said. "So it is no accident that we are viewing the region with a wider aperture to include India as one of the "bookends", as Secretary (of State, Rex) Tillerson calls it, of the region -- the United States being the other bookend," the official said, defending the use of term Indo-Pacific instead of Asia-Pacific for the region. The Indo-Pacific is a term that, in a sense, widens the aperture for the region, the official said. It talks about a region that encompasses everything from India to the West Coast of the US; all of the Asian countries in Northeast Asia; down in Oceania with Australia; the Pacific Islands, and New Zealand in the south; India to the west; the United States to the east; and, of course, Southeast Asia as the crossroads to all of that, the official said. With a vibrant area, a young demographically, one should be envious of the demographics, said the official. Prime Minister Modi is leaving for the Philippines on Sunday to attend the India-ASEAN and East Asia summits. Trump is also scheduled to attend the East Asia Summit, where he is expected to meet Modi. Meanwhile, in a veiled attack on China, Trump said the US would "no longer tolerate the audacious theft of intellectual property." "We will confront the destructive practices of forcing businesses to surrender their technology to the state, and forcing them into joint ventures in exchange for market access," the US president said. American firms have long complained about China failing to honour intellectual property rights. Trump had travelled to Da Nang from Beijing, where he had also discussed America's huge trade imbalance with China. In the speech, Trump said he had spoken "openly and directly" with Chinese President Xi Jinping "about China's unfair trade practices and the enormous trade deficits they have produced with the US." Trump's tone in Vietnam was strikingly different from the day before in Beijing, where the US president appeared to be friendlier toward the Communist giant as he sought Xi's help to reduce the massive trade deficit and to rein-in nuclear-armed North Korea. The bilateral trade between the US and China was worth USD 648 billion last year, but trade was heavily skewed in China's favour with the US amassing a nearly USD 310 billion deficit. Xi, speaking at the same APEC event shortly after the US President, did not respond to Trump's remarks, but said economic globalisation had become an "irreversible historical trend." Trump also used his speech at the APEC business meet to promote his vision for a free and open Indo-Pacific region. "We have been friends, partners and allies in the Indo-Pacific for a long, long time," he said. "The story of this region in recent decades is the story of what is possible when people take ownership of their future." China has already reacted cautiously over the proposal by the Trump administration for a working-level quadrilateral meeting, saying Beijing hopes that it would not target or damage a "third party's interest".